Mount Girnar is one of the hill in Ahmedabad which is most sacred to the Jain community. This hill rises to a height of more than 600 m, a climb marked by 10,000 stone-steps. On this hill various Hindu and five Jain temples are located. One of the largest and the oldest Jain temple is dedicated to the Neminath, the 22nd Jain Tirthankar. There is an image of Neminath in each of the courtyard colonnade’s 70 cells. This temple was built in the 12th century. The temple of Mallinath, the 9th Jain Tirthankar, is also another attraction on this hill. Besides this various Hindu temples are also located on this hill like the Bhavnath temple and the Amba Mata temple. 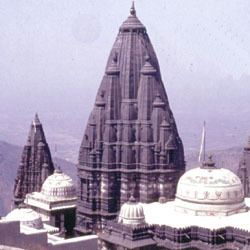 The Bhavnath temple is dedicated to the Lord Shiva. The newly weds came here and worship in the Amba Mata temple in order to ensure a happy marriage. When a traveler to Gujarat, Joss Graham, climbed up the hill for the festival of Shivaratri, he slept there overnight. He woke up on hearing the praying murmurs of the great mass of devotees, about 100,000 of them in their communities and tribal groups. This sacred hill is visited by millions of Hindus and Jains. The Mahashivaratri fair held here is attended by Nagasadhus and pilgrims from all over India.